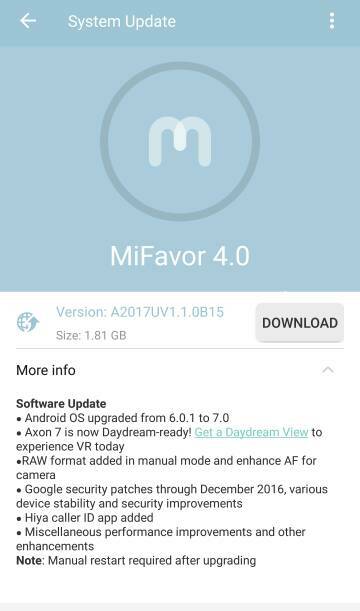 Nice to see nougat available for Axon 7 ..i will check on mine... As I have limited edition 6gb ram version..
Any improvements to the camera, particularly in low-light shots? Are you currently on Verizon with marshmallow? If so, any issues? My A7 worked on Verizon, but it always said "roaming" . What exactly is working? Voice, 3G data, LTE, all of the above? 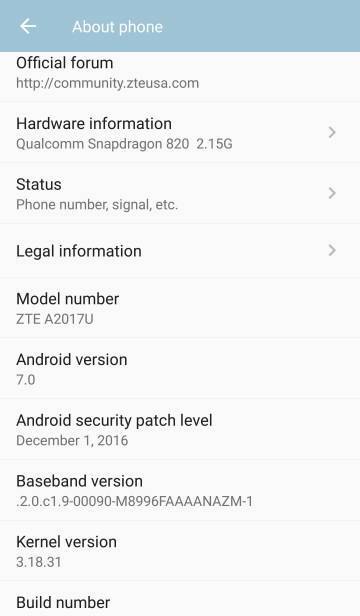 Has anyone completed the nougat update yet while on Verizon? Hows it working? Do you still get the "roaming" icon in the status bar? Camera is pretty much the same. Currently on Verizon. Roaming icon still there. LTE still good. No HD voice or data while on call so that hasn't changed. Making calls works. How come Android Central doesn't have an article about it? At least it's not in the app. Why? I guess that roaming icon is there just to anoy someone who wants to use an unlocked device not purchased from Verizon. Probably true, I haven't used a Verizon bought device in a few years and never have that icon. I think it also could be because the device is literally roaming on partner networks. Has anyone checked which LTE bands etc are in use? Hello, just got the update, seems good but sometimes there's lag, anyone have it? Mine was doing a few strange things like stuttering a bit with common tasks. I restarted the phone 2 times and I'm not seeing problems. Also I've had 11 app updates since Nougat now and the phone is running very well. Mines running incredible after it settled down for about 30 minutes after the reboot. My battery is on steroids today as well. By this time yesterday on MM I was at just over 50% with little usage. Today Ive had over 2 hours of phone calls and tons of web usage, a bunch of pictures to test the camera updates and a little video and Im at 72%. So far its been a great update. OhAlfie and huntnyc like this. How is the update using T-Mobile? When do Nexus 6 phones receive Android 7.0 update?